Pyotr Ilyich Tchaikovsky (born May 7 [April 25, O.S. ], 1840, Votkinsk, Russia – died November 6 [October 25, O.S. ], 1893, St. Petersburg), was a leading Russian composer of the late 19th century whose works included operas, ballets, symphonies, chamber music, concertos, liturgical music, solo songs, and piano compositions. At least one of his operas, Eugene Onegin, is an acknowledged masterpiece. He is regarded as the master composer for classical ballet, as demonstrated by his scores for Swan Lake, The Nutcracker, and Sleeping Beauty. Tchaikovsky’s music is famous for its strong emotion, and his technical skill and strict work habits helped guarantee its lasting appeal. Pyotr Tchaikovsky was born at Votkinsk in Viatka Province, which is located in the Urals 600 miles east of Moscow. He was the second of six surviving children of Ilya Tchaikovsky, a mining engineer then in charge of the iron works in Votkinsk, and Alexandra Assier, a descendant of French émigrés. On his father’s side, Tchaikovsky’s origin may be traced to Ukrainian village Nikolayevka in Poltava region. Pyotr’s great-grandfather, a Cossack named Fyodor Chaika, distinguished himself under Peter the Great at the Battle of Poltava in 1709. Pyotr’s grandfather, Petro Fedorovych Chaika, received medical training in Saint Petersburg and served as a physician’s assistant in the army before becoming city governor of Glazov in Viatka. Later the family name was changed to Chaikovskii, which is usually spelled in English according to the French transliteration, Tchaikovsky. Tchaikovsky had four brothers: Nikolai (1838-1911), Ippolit (1843-1927), and twins Anatoly (1850-1915) and Modest (1850-1916), a sister, Alexandra (1841-1891) and a half-sister Zinaida (1829-1878) from his father’s first marriage. He was particularly close to his sister Alexandra and the twins Anatoly and Modest. Tchaikovsky’s earliest musical impressions came from the songs that he heard in his childhood from his mother, relatives, folk singers, and from the peasants of the village. 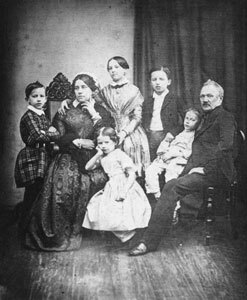 In 1843 the family hired Fanny Dürbach, a 22-year-old French governess, to look after the children and teach Tchaikovsky’s elder brother Nikolai. Pyotr showed signs of exceptional musical ability at an early age, but his parents did not encourage his interest. While Tchaikovsky, at four and a half, was initially considered too young to begin studies, his insistence convinced Dürbach otherwise. He began taking piano lessons and showed remarkable talent. Dürbach proved an excellent teacher, teaching Pyotr Tchaikovsky to be fluent in French and German by the age of six. Tchaikovsky’s childhood, despite such promising circumstances, was not a particularly happy one. Though Pyotr was deeply attached to his mother, she seems not to have been outwardly affectionate. He appears to have been even more devoted to his governess. At the end of 1845 he began taking piano lessons with a local tutor Mariya Palchikova and became familiar with the mazurkas of Frédéric Chopin and the piano pieces of Friedrich Kalkbrenner. Dürbach saved much of Tchaikovsky’s work from this period, which includes his earliest known compositions. In 1849 Pyotr’s father resigned his post and the family moved first to Moscow and later to St. Petersburg. Since music education was not available in Russian institutions at that time, Tchaikovsky’s parents had not considered that their son might pursue a musical career. Instead, they chose to prepare the high-strung and sensitive boy for a career in the civil service. In 1850 he enrolled in the St. Petersburg School of Jurisprudence, and, while studying law and government, he took music lessons, including some composing, from Gavriil Lomakin. When Tchaikovsky was fourteen years old, his mother died of cholera. Her sudden death was traumatic event for Pyotr. Though his musical training was informal, the boy composed a waltz for piano in her memory. Pyotr Ilyich Tchaikovsky as a clerk in the Justice Ministry, 1860. 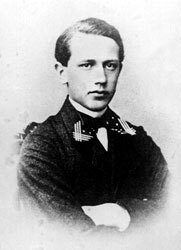 Tchaikovsky spent the years 1850-1859 as a boarding student at the School of Jurisprudence. While it was not an official priority at the School of Jurisprudence, Tchaikovsky maintained an extracurricular connection by regularly attending the opera with other students. Fond of works by Mozart, Rossini, Bellini, and Verdi, he would improvise for his friends at the school’s harmonium on themes they had sung during choir practice. 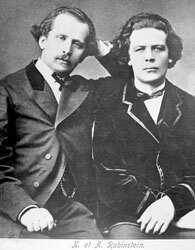 In 1855, Tchaikovsky’s father funded private lessons for his son with the teacher Rudolph Kündinger. At age seventeen Tchaikovsky came under the influence of the Italian singing instructor Luigi Piccioli, the first person to appreciate his musical talents, and thereafter Tchaikovsky developed a lifelong passion for Italian music. Following his graduation in 1859, Pyotr became a clerk in the Justice Ministry. Tchaikovsky was not naturally suited to such a job but he remained at the Justice Ministry for a few years. He worked hard, but he hated the job. By this time he was totally absorbed by music. He continued playing the piano and attending concerts and operas at every opportunity. He joined the Ministry’s own choral group, and in 1861, he began to take harmony lessons and to study musical theory with Nikolai Zaremba, the Head of the Russian Musical Society and enrolled at the St. Petersburg Music Conservatory. In 1863 he resigned from the civil service and broadened his musical studies, including instrumentation from the pianist and composer Anton Rubinstein, who became the first director of the new St. Petersburg Music Conservatory, was the first to see real signs of talent in Tchaikovsky. During the study period at the Conservatory Tchaikovsky composed a few orchestral works, among them was an overture based on Aleksandr Ostrovsky’s melancholy play The Storm (Groza), 1864. After graduating from the Conservatory in 1865, Tchaikovsky moved to Moscow, he accepted the post of professor of harmony at the Moscow Music Conservatory. He taught music theory, He found teaching difficult, but his friendship with the director. Nikolai Rubinstein, who had offered him the position in the first place, helped make it bearable. In 1866 he composed his first symphony, the Symphony in G Minor – Winter Daydreams (Zimniye gryozy), and in 1868 his first opera The Voyevoda (Voyevoda) based on Aleksandr Ostrovsky’s play. 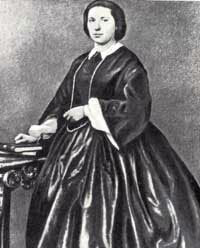 In 1868 Tchaikovsky met a Belgian mezzo-soprano named Désirée Artôt, with whom he fleetingly contemplated a marriage, presumably in an effort to conquer his homosexual tendencies, but their engagement ended in failure. The opera The Voyevoda had only five performances, but it was well received, even by the The Five. Tchaikovsky’s next opera, Undine (1869), was never produced, and the two that followed, The Oprichnik (1872) and Vakula the Smith (Kuznets Vakula) (1874), were unsuccessful. Symphony No. 2 in C Minor (1872), Symphony No. 3 in D Major (1875), the overture Romeo and Juliet (1869), The Tempest (Burya) (1873) and Francesca da Rimini (1876), the Piano Concerto No.1 in B-Flat Minor (1875), the 3-act ballet Swan Lake (Lebedinoye ozero) (1876), and his three string quarters (1871, 1874, 1876) were his instrumental works that earned him his early triumph. 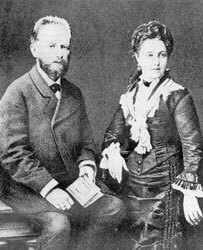 Late in 1876, Tchaikovsky had begun an extraordinary correspondence with an admirer of his compositions and devoted patron, the wealthy widow Nadezhda von Meck, who supported him with an annual stipend of 6,000 rubles. The relationship lasted for 14 years and allowed Tchaikovsky to quit the job he hated, teaching at the Moscow Conservatory. Thereafter, he could spend his winters abroad, usually in Italy and France, and his summers in Russia. They frankly exchanged their views on a broad spectrum of issues, starting with politics or ideology and ending with such topics as the psychology of creativity, religious faith, and the nature of love. By her wish, the two never met. The year 1877 was one of the shattering crisis for the composer. Tchaikovsky entered into his regrettable marriage of convenience with Antonina Milyukova, a 28-year-old ex-student from the Conservatory who had declared her love for him. He made a last desperate attempt to conquer, or at least conceal, his homosexuality. But their marriage collapsed almost immediately. 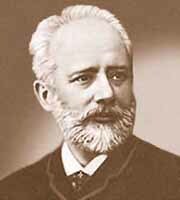 Tchaikovsky tried to commit suicide by walking into the river in an unsuccessful attempt to contract pneumonia. 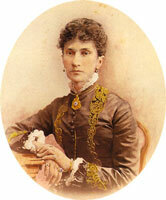 Nadezhda von Meck (1831-1894) was a Russian wealthy woman who became an influential patron of the arts, especially music. Late in 1877, Tchaikovsky’s friends sent him abroad for several months. The same year he composed two masterpieces – the opera Eugene Onegin (Yevgeniy Onegin), based on the plot of Pushkin’s verse novel, and the Symphony No. 4. Tchaikovsky continued to write operas including The Maid of Orleans (Orleanskaya deva) (1879), based on a tragedy by Friedrich Schiller, Mazeppa (1883), based on Aleksandr Pushkin’s poem Poltava, The Little Shoes (Cherevichki) (1885), a much revised version of Vakula the Smith, The Enchantress (Charodeyka) (1887), his fame was enhanced, as before, by his orchestral works, among these were the Violin Concerto in D Major (1878), the Manfrend Symphony (1885), based on the poem by Lord Byron, and Symphony No. 5 in E Minor (1888). His other major achievements of this period include Serenade for Strings in C Major, Opus 48 (1880), Capriccio Italien (1880), and the 1812 Overture (1880). In both 1888 and 1889, Tchaikovsky went on successful European tours as a conductor, meeting Brahms, Grieg, Dvorák, Gounod, and other notable musical figures. In 1890 Tchaikovsky suffered another personal crisis when his patroness Nadezhda von Meck arbitrarily terminated both his annuity and their long epistolary friendship. Despite this blow, which deeply affected Tchaikovsky’s neurotic, self-torturing ego, he composed in that year two of his finest scores, a ballet in a prologue and three acts Sleeping Beauty (Spyashchaya krasavitsa) (1889), and the opera The Queen of Spades (Pikovaya dama) (1890), based on a short story by Alexander Pushkin. In the spring of 1891 Tchaikovsky was invited to visit the United States on the occasion of the inauguration of Carnegie Hall in New York City. He conducted before enthusiastic audiences in New York, Baltimore, and Philadelphia. On his return to Russia, Tchaikovsky completed the one-act opera Iolanta (1891) and the two-act ballet Nutcracker (Shchelkunchik) (1892), based on Hoffmann’s story The Nutcracker and the Mouse King, and in February 1893 he started to compose the Symphony No. 6 in B Minor (Pathétique). A last visit to England in June 1893 interrupted work on the symphony, but it was finished in August. On 6 November 1893 Tchaikovsky conducted the premiere of his Symphony No. 6 in B Minor (Pathétique) in St. Petersburg. Nine days later, Tchaikovsky died there, aged 53. He was interred in Tikhvin Cemetery at the Alexander Nevsky Monastery, near the graves of fellow-composers Alexander Borodin, Mikhail Glinka, and Modest Mussorgsky; later, Rimsky-Korsakov and Mily Balakirev were also buried nearby.